The other night after dinner we climbed out of Ellie’s window and set pillows and blankets out on the verandah roof and settled down to look at the heavens. It was a cold, clear night – beautiful! Ellie says she saw thirty shooting stars. I told the children about the radio interview I heard recently in which they said that only 20% of the world’s population can see the Milky Way, thanks to the city lights. Amazing. I tried to get the children to be absolutely quiet for a full minute so we could listen to the stars. It proved impossible – too many giggles – but we did manage it for about 30 seconds and it was magical lying there under the starry skies in the absolute quiet of the night. No other noise other than the munching of cows. 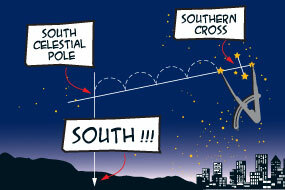 Chris showed the kids how to work out where south is by the Southern Cross. Draw a line through the two stars at the ‘head’ and the ‘foot’ of the cross and extend it. Then join a line between the two Pointers (line 2). Find the middle of line 2 then draw a perpendicular line down toward line 1 until the lines meet. The point at which the lines 1 and 3 intersect is the SCP. From there just look straight down to the horizon and you’ve found south. An easier way is to simply extend the main axis of the Cross from and in the direction of its brightest star by four and a half times its length. 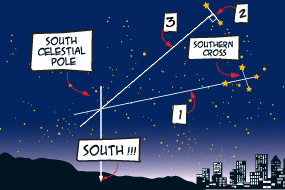 You have now reached the South Celestial Pole – the point about which the Cross and all stars turn in the sky. From the Pole drop a line straight down to the horizon – that is south. So, book a dark moonless night sometime and have a starry starry night date with your children – one more thing, chocolate is always a welcome addition to the night! I’ve been meaning to lie out on the tramp with the kids to look at the stars but never seem to get around to it – so glad of your lovely reminder. Must do it next clear starry night. I love to point out the constellation Pleiades and tell the kids that it is even mentioned in the bible. Quite amazing to look at it and think that even Moses, Job and Jesus, would have looked at it (well he made it ….) and we can look at the very same constellation too. Cool. Well I never heard that !!!!!!!!!!!!!!!!!!!!!!!!!!!!!!!!!!!!!!!!!!!!!!!!!!!!!! You can even download their eerie sounds on a website. Stars—themselves spherical—can produce notes through their vibrations, like musical instruments. We can’t hear the sounds directly, but astronomers can detect them through asteroseismology—looking beneath the surfaces of the stars into their cores. Stars produce whistling, drumming, humming or rumbling sounds, said Kurtz, though their frequencies—or speeds of vibration—must be artificially boosted to bring them into human hearing range. So there you have it, Kaitlyn. Pretty cool, eh? Singing stars.